Striped Shirt, Collared Blouse: Forever21. 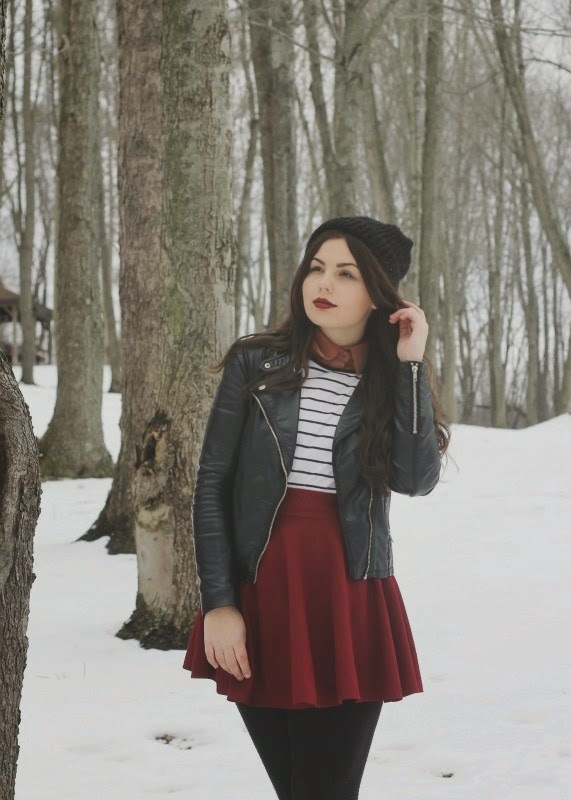 Wine Colored Circle Skirt: c/o OASAP. Hat: Handmade from an older lady. It's warmed up a little bit in Ohio (aka above 32 degrees), so I've been snapping photos outside the past few days, taking advantage of the "warmth." There's a little park less than five minutes away from my apartment, so it's been nice to just pop in my car and head on over there. Since I had the day off school today, I took the chance to go over to the local Goodwill and check out what they had. I've been to this one in the past and haven't been too impressed, but today must have been my lucky day! I walked away with a plaid flannel, a firework sweater (lol), the perfect black t-shirt, and a really cool shearling jacket. I found also the perfect, worn in denim jacket... but they wanted $7 (because it was a "winter coat") which I was not willing to give over. With my new apartment now and having just got back from Italy, I don't have a ton of money and am really trying to watch what I spend, so I was sad to let it go...maybe if I'm lucky it'll still be there in a few weeks! Also, I've found another smart way to save money on a college student's budget. When it comes to buying groceries, the Dollar Tree is actually really great. They have surprisingly a ton of food, a lot of it name brand, each thing only for $1, never any more. It's not out of date, there's nothing wrong with it...so I don't see why more people don't go there! They also just have so many cute decorations and such for my apartment to make it more lively and "me"--obsessed with their Valentine's Day section right now! I have a very similar skater skirt and I wear it constantly. It's a super versatile color! I love yours with the striped top and leather jacket. 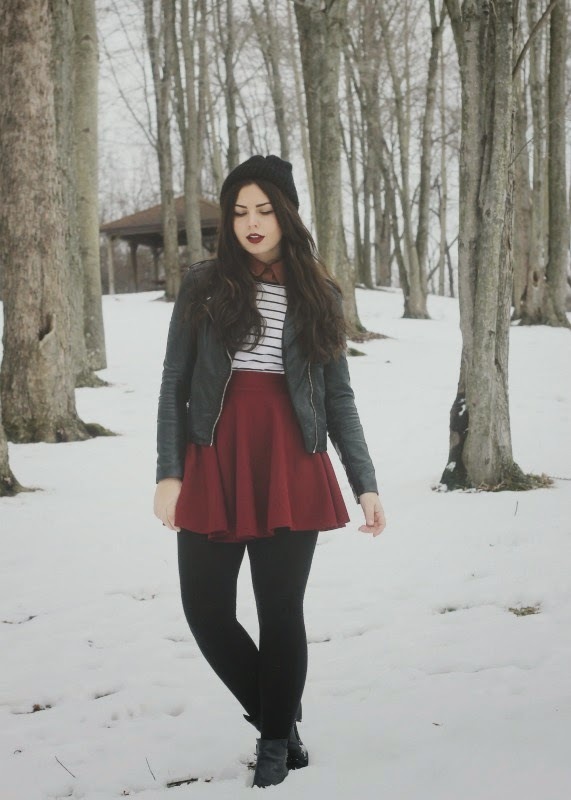 It's a very cool winter look. you reminded me of some american series mostly outfit. i love this so much Lauren! 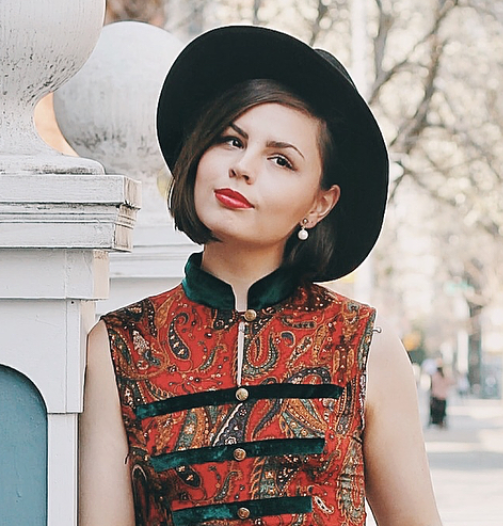 This outfit is awesome- and your hair and makeup are so beautiful! Great colors and photos. Lauren, you look beyond lovely! I adore that lipstick! Congrats for the new apartment and best of luck on the new year! I hate when thrift stores don't let you haggle over an item. I once found a JCrew coat that had this giant ugly stain on it, and they wanted $20 for it! Ridiculous, haha. 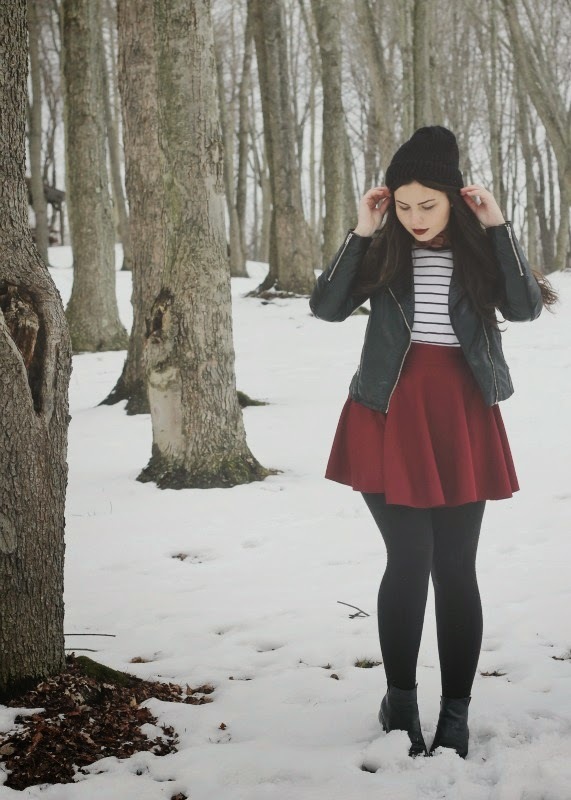 Lovely blog and outfits! Keep up the good work. Gorgeous outfit! I love the colour of your skirt and the leather jacket is a perfect touch!